When winter comes, so comes the ability to conceal and carry a wider variety of guns. Bulkier clothing conceals the larger gun and having the ability to have more things with you gives you more conceal options as well. While winter clothing does give you a lot more ways to conceal/carry, it isn't without issues for those who want to ensure they're taking all the precautions they can when it comes to personal safety. The main problem with winter clothing is the ability to get at the conceal/carry weapon easily. Not only do you have layers of clothing to deal with, especially if you prefer an inside the waist holster, but boots and snow makes an ankle holster almost impractical. Also, making sure you have a conceal/carry position where you can easily clear the weapon without getting a hammer or a sight hung in threads or overlapping cloth is a major consideration. 1. Fanny Packs - For those who like to jog, you probably already are well aware of how a fanny pack can make for a very effective conceal/carry option. There are fanny packs specifically designed for conceal/carry with both left and right access as well as pouches for extra magazines, etc. 2. Conceal/Carry Coats - Many coat manufacturers are taking into account the conceal/carry market and have designed coats specially designed for winter. For instance, at the NRA store, you can purchase a leather Bomber jacket designed exactly like the original, including the map on the liner. The main difference is two pockets specifically designed for conceal/carry and easy access. 3. Tactical Vest - One key element to staying warm during the winter is to keep your core temperature up. With a vest designed for conceal/carry, not only is it as easy to get to a gun as it would be if you weren't wearing winter clothing at all, a vest with lots of pockets can be an inestimable resource all it's own. 4. Split Coats and Dusters - If you can't get comfortable with your draw with some of these other options, wearing a coat with splits on the sides or a duster that gives you easy access to your waist holster may be an option. 5. Cargo Style Pants - Cargo pants are popular because they have pockets on the thighs. This could be an option for you, especially for small frame automatics such as the Ruger LCP or Kimber Solo. 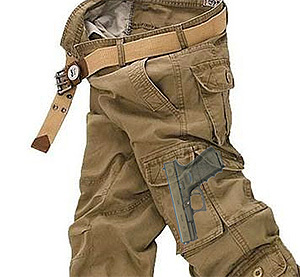 These pockets are large enough and bulky enough to conceal a small auto easily. 6. False Pocket Coats - Some winter coats actually have what looks like a pocket but is actually an access point so you can reach your belt or shoulder holstered weapon. These are good when you don't want to change your conceal/carry setup but have to have a warm coat. 7. Bottom-zip Coats and Jackets - Some coats and ski jackets are designed to be zipped open from the bottom. This makes access to a belt or shoulder holster barely more trouble than with a regular buttoned suit-coat. 8. Backpacks - During the winter, especially for those who normally carry briefcases or backpacks to start with, having a backpack specifically designed for conceal/carry is an easy solution. 9. Coats With Sleeve Pockets - Many ski jackets and CCW coats are designed with small sleeve pockets which are perfect for extremely small, lightweight guns such as the Ruger LCP and Kahr P380. Access can be a little tricky, but as a tactical solution, it may serve well. 10. THIS ONE IS FOR THE LADIES! - Winter is the perfect time to change purses and with the wide variety of larger, CCW purses available, finding the perfect solution for you is a cinch! There are things you'll want to keep in mind when dealing with winter CCW options. For instance, realize it will take seconds longer in many cases to access your weapon, so practice your draw so you can become familiar with the issues. Also, don't wear hooded gear if at all possible as hoods restrict your peripheral vision. Don't wear gloves if at all possible. However, if you must, make sure they're thin enough to enable you to fire your weapon. Practice firing your weapon while wearing gloves and under cold conditions so you'll be familiar should the need arise. One alternative is the fingerless type of driving glove as these will keep the core of your hand warmer while still allowing the functionality of your fingers. Winter does give you lots of conceal/carry options, but knowing how to handle them can be the key to survival.